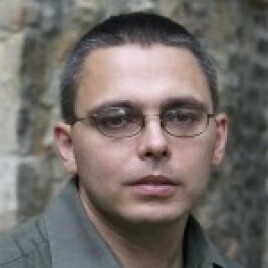 György Dragomán is a Hungarian author and literary translator. He was born in Târgu Mureş (Marosvásárhely), in Transylvania, Romania. In 1988 his family moved to Hungary. He went to school in the western Hungarian city of Szombathely, then to university in Budapest, where he obtained a degree in English, and studied Philosophy. His best-known work, The White King (2005), has been translated into at least 28 languages. He has received various literary awards for his writing, such as the Sándor Bródy and the Jan Michalski Prize. As a translator, György Dragomán has given voice, in Hungarian, to authors such as Samuel Beckett, James Joyce and Ian McEwan. György Dragomán lives in Budapest.